Far from a gimmick application, Force has been developed by a team of computer scientists and automotive experts to be a serious diagnostic and performance tool. Paired with a Bluetooth ELM OBDII module, Force provides the functionality of an OBDII code reader and much more. Force contains a database of over 2,000 diagnostic trouble code definitions and supports over 200 PID's (Parameter ID's), most of which can be be logged to an external .CSV file. Force can help keep your vehicle running, diagnose your vehicle when it stops running and save you from having to pay your mechanic every time your check engine light comes on. Force doesn't just provide an OBDII interface, it will measure your vehicle's performance, too. Without the need for an OBDII compliant vehicle, Force can provide torque and power estimations comparable to any chassis dynamometer. Force even provides a drag race feature that measures your cars acceleration in terms of distance and velocity. 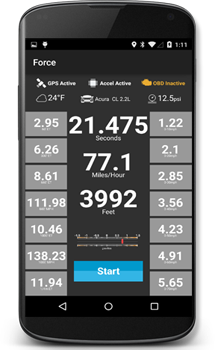 Instead of relying on the vehicle's OBD system to estimate torque, power and acceleration, Force uses your phone or tabets GPS and acceleration sensors to make measurements of the vehicle's performance. These measurements can be far more accurate than what you would typically get from logging the OBDII parameters, and allows Force to work with older vehicles that are not equipped with OBDII systems. Force can help you fix your vehicle, keep your vehicle at peak performance and save you money. 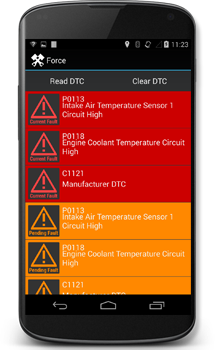 Paired with a Bluetooth OBDII module, Force can read and clear both stored and pending diagnostic trouble codes while also supporting over 2,000 SAE code definitions. No need to go lookup what the code means, in most cased Force will provide the code definition for you. Most manufacture defined codes can also be read and cleared as well. Force will also log vehicle engine sensors and other parameters allowing for better understanding of how the engine is performing. The data is written to an external .CSV file which can be opened in any spreadsheet application for further analysis. Force works in the same way as a chassis dynamometer in that it measures the engines ability to accelerate an object. Where a chassis dynamometer measures the acceleration of a drum rotated by the vehicles wheels to calculate the torque and power, Force measures the vehicles acceleration on the road taking into account the vehicle weight, gearing and wind resistance to calculate torque and power. Force will generate torque and power measurements comparable to a chassis dynamometer. 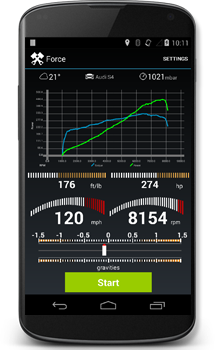 Force relies on your smartphone or tablet’s internal sensors (the GPS and acceleration sensor) and highly tuned digital filters to estimate torque, power and acceleration without the need for external OBDII modules or additional sensors. Force can produce highly accurate performance estimations at over 50Hz (50 times per second) which is five times faster than the 10Hz (10 times per second) that most of the vehicle performance boxes get with their GPS or OBDII. Torque and power are meaningless unless you can effectively put that power the ground and accelerate the vehicle. Force provides acceleration measurements so you can see just how fast your vehicle is. Unlike most vehicle performance boxes which provide measurements at 10Hz , Force can provide GPS based velocity measurements at upwards of 50Hz. Think of Force as your own personal drag strip.